Automotive output in January stood at 179,595 units, up year-on-year by 8.06%, on increased production for domestic and overseas markets, the Federation of Thai Industries said on Thursday. Thailand is set to launch Digital Park Thailand, which its says will be the biggest digital innovation hub in Southeast Asia. A committee vetting the controversial rice bill has delayed tabling the draft law for its second and third readings following heavy criticism, according to the National Legislative Assembly (NLA). US recruitment agency Manpower Group Thailand forecasts an unemployment rate in 2019 of 1.1-1.2%, equal to 418,000-450,000 people, up from 400,000 in 2018. ASN (Asia Sponsorship News) has just released its Sponsorship Market Overview for Thailand 2018. The Department of Foreign Affairs (DFA) and Central Bank of the Republic of Philippines have notified the Angolan authorities that the USD 50 billion Thai cheque is in fact fake, a key evidence in the “Thai Swindle” trial. The Minimum Wage Committee plans to finalize this year’s Minimum Wage increase for all 77 provinces within March. In another desperate bid to curb the high alcohol consumption blamed for road traffic deaths, health authorities have come up with an idea to ban booze sales on Songkran Day on April 13 every year. A Thai air force’s C-130 transport plane carrying Prime Minister Prayut Chan-o-cha returned to Bangkok’s air field on Thursday due to an engine trouble, according to local media. Thailand and Hungary have established a cooperation to adopt the Danube River’s water management strategy for the Mekong River. The Thai Industries Sentiment Index (TISI) increased to 93.8 points last month from 93.2 in December on big government investment projects, domestic consumption and the general election scheduled for next month. Airports of Thailand Plc’s (AoT) board gave the nod Wednesday to a 42-billion-baht plan to build a second terminal at Suvarnabhumi airport, but it scrapped a blueprint for the terminal’s design. The Criminal Court on Thursday postponed the hearing of defence witnesses in the trial of red-shirt demonstrators arraigned on terrorism charges, because many of the defendants are running in the March 24 general election. The Thai life insurance industry is expected to grow between 3 and 5 percent this year. THE NATIONAL Human Rights Commission (NHRC) has urged the Royal Thai Police to amend its rules on publicly releasing juveniles’ criminal history. Footage of the moment a loose elephant runs wildly in a river before running into a tourist’s raft and overturning it and injuring one person, has gone viral and turned into a cautionary tale today. Nearly four years after the U.S. Federal Aviation Administration stripped Thailand of its Category 1 safety rating, the Southeast Asian country has accelerated efforts to address a variety of oversight and other shortcomings in a bid to restore its former standing with the FAA. Regaining Category 1 status would allow Thai-registered airlines to launch new routes to the U.S. and participate in codeshare agreements with U.S.-based carriers. Just over a month before Thailand’s long-delayed elections, police say they are seeking the prosecution of the leader of a new political party for allegedly spreading “false information” about the military government in a speech posted on Facebook last year. The Election Commission (EC) is considering bringing criminal charges against disqualified election candidates and political parties after some of them were found to have tampered with membership records and databases, a source said. The Metropolitan Electricity Authority (MEA) announced changes to the service charge for getting electricity. LGT, the international private banking and asset management group owned by the Princely House of Liechtenstein, today announced the opening of its wealth management business in Thailand, following the successful award of regulatory approvals. The Ministry of Defense is asking members of the public, especially millennials and political activists, to express themselves constructively and in a peaceful manner. The Royal Thai Police on Wednesday held a press conference to announce the arrest of visa and short-selling scammers. The Government Savings Bank (GSB) has joined hands with the Thailand Professional Qualification Institute (TPQI) to elevate occupational accreditation in order to boost confidence among employers and consumers. The 63rd Bangkok Gems & Jewelry Fair is now underway as organizers expect a 2.4-billion-baht cash flow throughout the 5-day event. The Bank of Thailand expects 10 financial and non-financial institutions testing out facial recognition for electronic Know Your Customer (e-KYC) technology in the regulatory sandbox to exit this stage, paving the way for banks to offer passbook account opening through mobile banking apps in the next quarter. 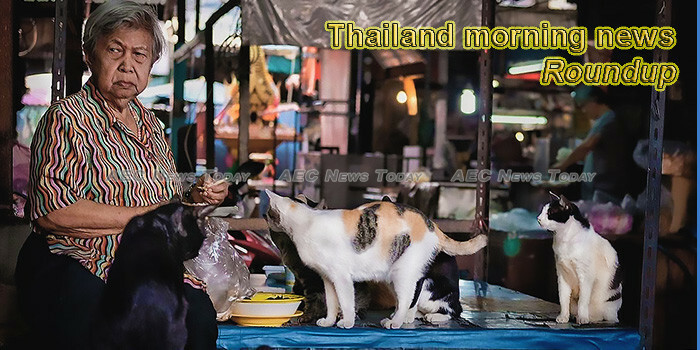 The Krabi governor has ordered provincial livestock officials to move all stray dogs from Ao Nang beach after a gang attack a Finnish boy. The private sector has donated as many as 15,000 pollution masks to traffic police to protect their health while on duty. FOUR KEY university networks voiced opposition yesterday to the establishment of the Higher Education Department. The Community Forest Bill aims to give villagers more say in managing natural resources but is too limited in its scope and risks further marginalising those living outside areas covered by the act, land campaigners said on Thursday. Air quality in the Bangkok area has improved slightly this week with the overall air quality being very good, while the northern region continues to suffer from haze due to forest fires and agricultural burning. Thai politics goes to court. Again. The Constitutional Court’s decision on Thai Raksa Chart is likely to be swift but unlikely to be impartial. The sudden reality of legal, medical marijuana this week has only added new urgency to questions about what is legal for whom, where and when. PHOTO: Department of national parks, wildlife and plant conservation The body of a young elephant has been found with plastic inside its large intestine in Chachoengsao (north of Chon Buri) yesterday. by VOA A Cambodian official has reported that about 23% of children in three provinces along the border with Thailand have stopped attending school. AUTHORITIES IN the deep South claim state policies are proving effective in stemming the flow of fresh recruits to militant separatist groups. A relatively unknown MP candidate in Mukdahan province suddenly found herself at the center of attention on social media this week – probably not for the reason she wanted. The 3rd Army Area of the Royal Thai Army, along with American and Singaporean soldiers, have handed over a newly-constructed building to Ban Koh Ai Duan School in Tak province.